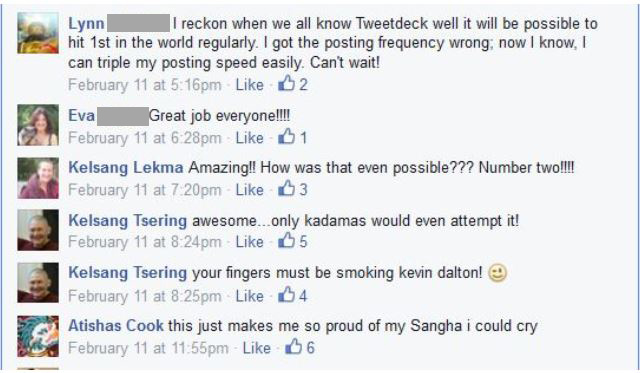 The New Kadampa Tradition’s (NKT) misinformed war of hate on the Dalai Lama is being waged increasingly via social media – and often with blatant disregard for ethical and moral principles. Lately they have been boasting success on Twitter in managing to get their hashtag “#DalaiLamaStopLying” high in the charts of worldwide Twitter trends, giving a false semblance that they are garnering wide, grass-roots support for their spurious cause. According to “Atishas Cook”, the latest “Tweetstorm” they orchestrated saw them manage to register 40,000 Tweets in one hour. Without a hint of shame or irony, they state that by these two-hour timeslots of concentrated Twitter blitzing they are, in fact, just “cooking up” a Tweetstorm, blithely ignoring the dishonest implications in the term “cooking up”. For the truth is that these Tweetstorms are faked and their world-wide, high trending rankings are rigged. In this article we will show you how just a few dozen NKT devotees can easily manage to pull off 40,000 Tweets in an hour. It is both alarming and sad to witness the extent to which compassionate people who were drawn to the NKT with sincere, positive motivation, permit themselves to become increasingly sneaky and deceitful in the name of promulgating the truth and the path to enlightenment for all. Similar to any other religious or political extremist group, for whom the doctrine of the-ends-justify-the-means has become the supreme maxim, all manner of non-virtuous and unethical behaviour is justified by the dangerous and erroneous presumption that all that matters is their intention. The NKT’s use of trickery and deception to pull the wool over benighted eyes in the name of the supposed higher cause of their “virtuous intention” is deplorable because, in practice, it encourages a fundamental disrespect and superior attitude toward those for whom it claims feelings of compassion, and a manipulative, controlling attitude towards those it claims to liberate. Worse still, as they bask in Conrad’s “comfort of complete self-deception”, they fail to understand that far from being protected by their good intentions, they are tragically going astray. Not only do they show no shame for the dishonesty and trickery they use to get their hashtag trending high in world-wide Twitter charts, such is their total self-deception that they think this dishonest spamming fakery constitutes meritorious action – when the Tweetstorm is over they pat each other on the back, reminding each other: “don’t forget to dedicate your merit”. Indeed, as “Atishas Cook” glories in the success of their giant con- trickhe declares that he is “so proud of my Sangha I could cry.” He is oblivious to the inherent dissonance of a supposed Buddhist taking pride in his Sangha’s skilful scamming and the seeming success of a dedicatedly unethical campaign. 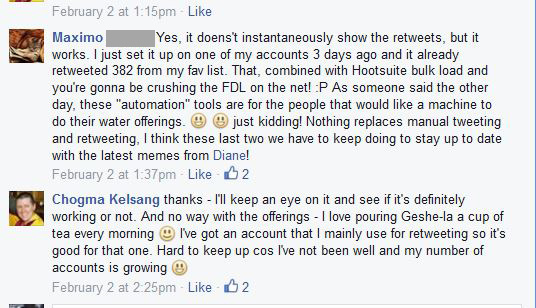 So what is this Tweetdeck that Lyn et al are trying to master? It allows you to schedule Tweets and you can operate more than one Tweetdeck with several accounts. Twitter limit the amount of Tweets you can send from one account to about 300 in one hour, so in order to get round this limit the NKT devotees set up loads of fake accounts and use Tweetdeck to upload all the Tweets at once. 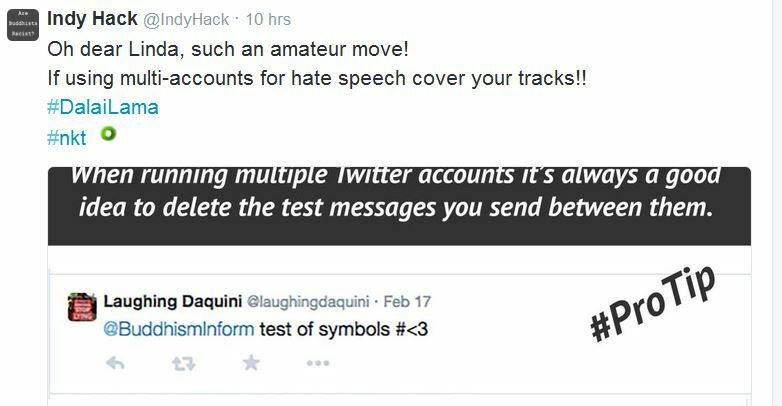 Stephen comes up with yet another cunning plan, for setting up false accounts for spamming, one that can’t be easily detected. 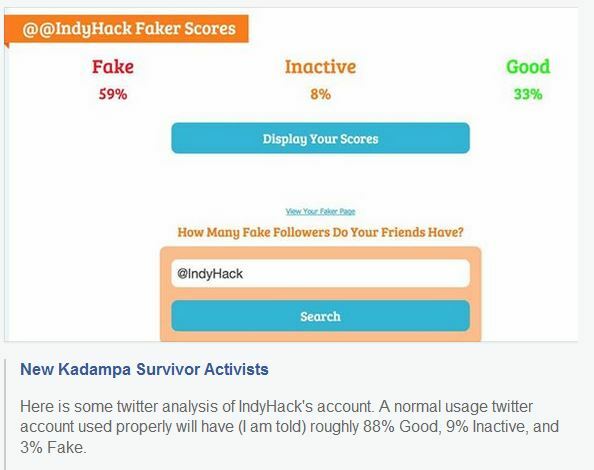 He advises some NKT tweeters to follow the example of Indyhack, who is “having more success than anyone else because he is seen as an unbiased, independent news source”. The key words here are “seen as”. 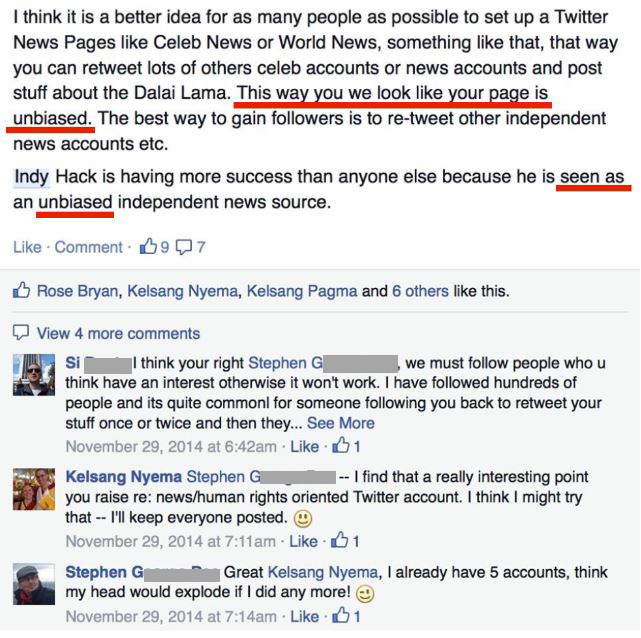 It may come as a surprise to Stephen, but it’s likely that most people would not consider Indyhack anything of the sort: it is in fact plain as day to even the moderately informed, that he is nothing but a deceptive NKT propagandist, masquerading as an independent journalist. Let’s do some math here: If Joel does manage to operate 17 accounts with 3 Tweetdecks as he claims he can do, that means he alone could produce 17 x 300 = 5,100 Tweets in 1 hour. When you see the strategies these tech-savvy tweeters deploy it actually starts to make the 40,000 Tweets they manage in one hour look rather paltry! 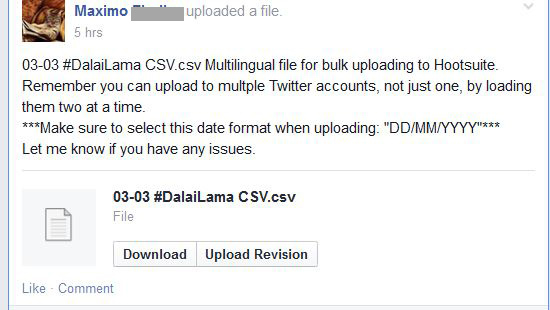 Here’s Maximo explaining how to use all the tools he’s providing to “crush” the Dalai Lama on the net to Kelsang Chogma, who’s not been well lately (seems she’s a tad overwhelmed by all the fake accounts she has set up for herself). In parenthesis, he also reveals that it is Diane who is the chief creative genius behind the appearance of all those deceptive, violently disrespectful memes that the NKT love to circulate. However, perhaps the NKT’s glory days on Twitter are coming to an end. RoundTeam, a Twitter content management platform, has been watching and investigating and has clamped down on some of the NKT multiple fake accounts. Furthermore, their latest TweetStorm failed to make the Twitter trending charts despite the record number of Tweets they generated. Has Twitter uncovered the various, fraudulent means they use to flood them with their hashtag spam? 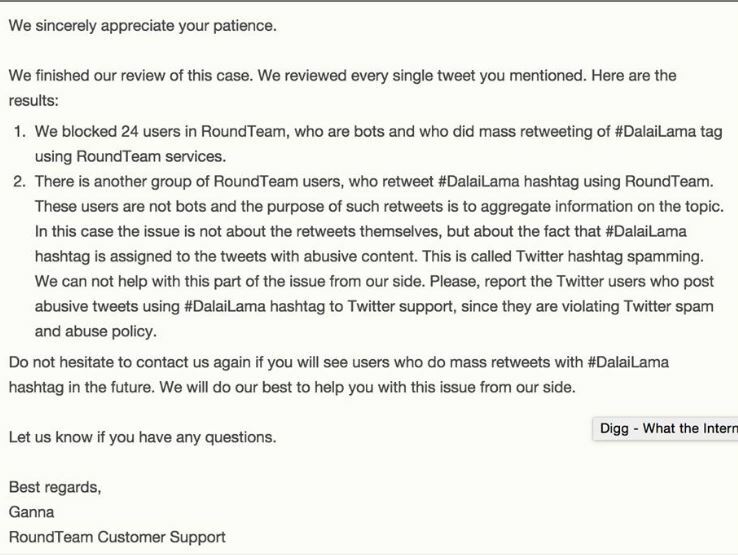 Totally oblivious to the irony of their complaints about foul play on Twitter, Kelly and Peter bemoan their non-appearance in the Twitter trending charts and accuse the Dalai Lama himself for this outcome, through corruption! It’s called “projection” Kelly, or “the pot calling the kettle black”, Peter. 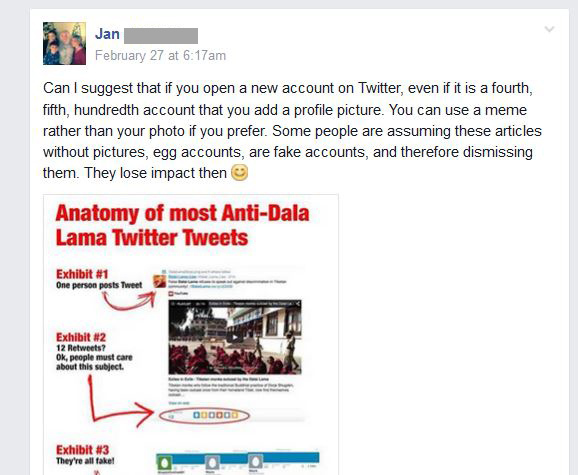 So if you’re one of these NKT fake tweeters, it is not the Dalai Lama who is up to crookery and dirty tricks on Twitter – it is you, it is all of you. Great work Linda. They are increasingly appearing as a warped Buddhist version of Scientology. What nasty people and to believe it could be meritorious to slander and attack and lie. They are indeed a sad deluded bunch. I very much liked the Conrad quote by the way. Amazing how insightful the man was. Clearly, the message is dont waste time combating cult fanatics who already have decided they are right about everything, but rather report all instances of spamming and abuse directly to the relevant social media platform. Sometimes things get a little too personal here [on both sides, thus lowering both parties to the same level] This report however furnishes one with the evidence to expose the cults hypocrisy, without descending to their level of gutter politics.Of course, if the NKT had any faith in the genuine veracity of their opinions, they wouldnt have to resort to these dirty tricks. One wonders who is leading; who is providing such immoral guidance? Certainly, it doesnt look like KG is directing-he would recognize the folly of such tactics if he had any degree of genuine insight…….? Thank you Matthew 🙂 Yes the Conrad quote has long been a favorite of mine. I remember the first time I saw it and how surprised I was by the last word in it – not what I expected at all! The Nameless, with regard to whether or not Kelsang Gyatso is aware of what they are up to, if he’s still alive then I’m fairly sure he is, as are all the senior NKT people. Rabten is one of the people commenting with praise and wonder in the screenshots! Furthermore, Atishas Cook has defended some of their controversial activities with comments on the lines of “if the higher echelons in ISC disapproved of what we do they would let us know – but they don’t – so they must think it’s all just fine”. It is very difficult to report this sort of thing to Twitter themselves but you can easily write to this analytics company who do graphs and charts showing the trending hashtags. Below is a link to the company that the NKT Tweetstorm organisers use to monitor the statistics of their hashtag. I just used the contact form in their website to draw their attention to the spamming/fraud techniques NKT use to promote their hashtag, and provided them a link to this article. There is a box on the complaint page asking you to elaborate on why the tweet is a breach of Twitter rules where you. can copy and paste the above article URL along with a brief explanation of why it violates. Complaining to Twitter about every one of their 40,000 Tweetstorm Tweets would be a huge undertaking!! What this article does is expose the systematically fraudulent nature of their spamming campaign. However, we could complain about some of the offending Tweets, at least, including a link to this article. To find offending tweets all you need to do is go to the search box on Twitter and type in the offending hashtag. All we need now is for the NKT to realise the extremity of their corruption and hypocrisy in lobbying this issue.After all, if they have a genuine cause, why the need for all the lies, hatred and manipulation? There current campaign has completely forgotten about the issue and is just focused on hating HDL, Thurman etc. If only the moderates would tell the übermensch they’ve lost the plot and their lies and scheming are destroying any chance of their ever being heard. Change has to come from the bottom up I fear- but Foley, Khyenrab Atishas Cook et al are just too arrogant to listen. They obviously think their foot soldiers are dispensable fools who understand nothing, whereas actually it is the moderates who hold the key….they übermensch even support Indy and think nobody knows who he is! I think where they are now just indicates from where they started. What was the root of the protests? IMO and observance the root of the protests is the hate of Kelsang Gyatso against the Dalai Lama. The NKT founder is totally overwhelmed by his hate and has inspired the same hate in his closest students who spread the hate among the NKT followers. Where the protests are now is only the expression from where it started. I remember on the Dorje Shugden Virtual Demonstrations page, it almost came to a point where there were two distinct camps, those that agreed with the one tactic of posting strong images and those that did not. It seemed to me that the group was near imploding. Regardless of differences, in opinion I think the most important thing is to maintain unity and harmony within the group, otherwise we blow our chance to bring down the ban over something that ultimately isn’t worth it. Recenly I wrote to our local community paper that was running free listings.They have since deleted NKT events. This is the sort of simple, small actions that anti-cult people should be doing everywhere. Would you care to share your wording and tips on you did it? Tips and guidance on how to make these sorts of approaches to third parties more effective would be useful. This …day the New Kadampa Tradition “Buddhist” group are offering a Free Talk and Meditation in …. on “Overcoming Stress”. Seems thoroughly innocuous doesn’t it? But who are they really? They prefer to keep it a secret, but they are the group behind a world wide campaign to defame His Holiness the Dalai Lama, and whom the Guardian describes as an “extremist sect” and whom many former members describe as an abusive “cult”, who use tactics similar to the Scientologists. When I was the Education Programme Co-ordinator for my local centre (now defunct) I would always try to get press coverage ie free publicity whenever we tried to branch out to a new town. So if anyone spots NKT Public Talks being held in their towns or nearby towns, that is a good time to contact the press yourself. Thank you for this article, it certainly exposes many of the ISC activists as being frauds and shows the illegitimacy of their ’cause’. My slant on this issue is a bit different, as I do not agree that this is exclusively an NKT issue. My own investigation has also led me to believe that Gyatso is not aware of the extent of the ISC activities, nor is it correct to equate the NKT proper with the ISC. However…: I have had my own run-ins with ‘Atisha’s Cook’ and completely oppose his/her activities and extreme views. I think it is very important to expose this aspect of extreme Shugdenpas as lying frauds. They are only causing damage on both ‘sides’. I will say that I have been a Shugden practitioner for a long time and am completely and utterly against the activities of the ISC – and there are many of us. For a long time I have tried to show NKT friends of mine that certain ‘high profile’ individuals like Khyenrab, Atisha’s Cook (what a presumptuous name! ), Pema, Tubchen, Jangdom or Rabten are completely blind with anger and closed to any sort of dialogue. My recent encounters in a discussion with ‘Cook’ and others led to accusations of me being a self-righteous idiot and all my comments were deleted! So much for freedom of speech. I have FB printscreens of this. Sadly, I believe Rabten, whom I know well, has been manipulated and used and I fear that he might be chucked out of his role once his function is no longer of use. Same for Jangdom. This tweet storm further proves that they are not fighting for the freedom to practice Shugden at all: they have created a monster which is simply trying to survive on its own momentum; so they resort to silly tactics like this one. For me and those ex-NKT who were rather inner circle members within NKT, who know how the organisation functions, it is totally clear that ISC=NKT. Almost nothing can be done in NKT without Geshe-las approval and if you disagree or even disobey you are rebuked or fired in an extremely rude and brutal way by him. However, “that Gyatso is not aware of the extent of the ISC activities” might be true. Rumours go he might have certain old age sicknesses which make him unable to think for himself. Those people say, this is why he is hidden from NKT followers. They speculate, that NKT followers might be shocked to be faced with an old man who lost memory and obviously is not omniscient (anymore). However, this is just a rumour so far. But there must be a reason why he is blocked from being seen by his students. However, even if he lost track of the what the ISC is doing he is still the person who ordered and stopped the protests at least until 2008/10. 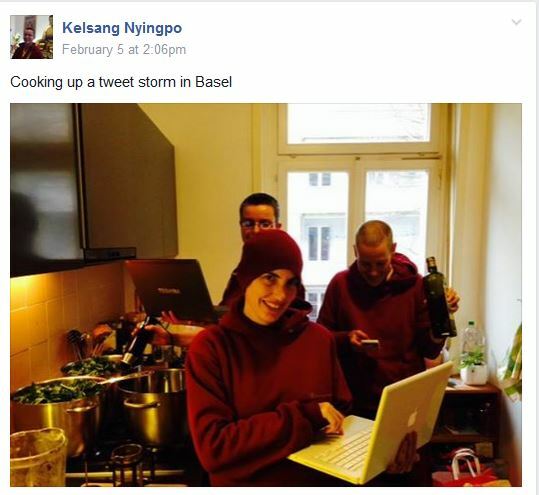 What could be the situation now, based on the new personal health situation of Kelsang Gytaso (is he still alive? ), is that there are new power games unfolding behind his throne and that the ISC protests have found their own ways without his approval or disproval. I am happy to see that you are a Shugden practitioner but didn’t throw away you discriminative faculties (intelligence). This is a rare encounter in my life with Shugden pas and it is also a bit healing for me. Good that you have done your best to oppose these heavy negativities. But as you see it is like speaking against walls. In East-Germany we called these types of state bureaucrats “concrete heads”, they cannot think even a bit of outside their ideology (or box). I have had a high opinion of Rabten and I remember and like to remember certain situations with him at Manjushri Institute – including that he, who was so busy – took time to go to the temple and meditated. This gave me a very good example I still hold in my mind. I am sure that Rabten has been manipulated but he also allowed others to manipulate him. Besides being a “victim” of the NKT system he has also some personal responsibility and integrity he could cultivate. It is also he himself who has allowed that non ethical behaviour – such as lying & deception … sneaked in into his spiritual life and actions. I can only hope for him that at one day he finds back to honesty and truthfulness and integrity. That he cultivates some introspection, self-awareness, self-control and critical inquiry – but I fear it is too late. Why? Following a “cult” what can happen is that at one point your mind makes big leap into the truthfulness of the propaganda of the “cult” and this becomes your true reality. I’ve observed and also heard that at one point you might pass beyond return for the rest of your life and cannot leave this world anymore your mind and the group created. It is then your reality. It could be, unfortunately, Rabten has made that leap. I don’t know anything about Jangdom. But I totally agree with your perception that they have created a monster. Its all shadow boxing against this monster and the driving forces are ignorance, hate and attachment. It is a real mess! Its very sad, so sad! Sometime I remember I was on the way to end up like them. I cannot even condemn them. I can just be so lucky to not to be in their situation. Feel free to post more information and if you wish so, you could also write a guest post for the blog. Thank you for your reply! Actually we have discussed here about two years ago and met through a mutual friend in Brighton, not sure you remember. I know the demos were requested and directed by Gyatso in ’96, stopped in ’98 and once again requested in 2008. It is also true that the ISC has always been run, at least institutionally, by people from the NKT. Although I personally never agreed with that kind of approach, I respected the decision ( I should perhaps add, that I definitely disagree with the Dalai Lama’s “ban” or advice on Shugden; aside from that, I am a huge admirer of him). Although most participants seem to be affiliated with the NKT, there have always been a significant number of protesters of Tibetan origin. In 2008 I attended a protest to see what it was all about. I met several Tibetans, some of which were a family living with relatives in Switzerland. They seemed like genuine people and really had suffered a lot due to the “ban”. There have also been some people from Kechara (Tsem Rinpoche) and a group of people from Rabten Choeling, also in Switzerland. I therefore have to conclude that the ISC is primarily NKT but not exclusively. Also I know many of the people who wrote the awful book ‘A Great Deception’. There were at least two non-NKT Tibetans involved in this text. Another reason, is that not all NKT practitioners are involved in the protests. Many well known teachers prefer to stay out of it. But you are right, they do not criticize it either… As you know, I have practiced within the NKT for a long time (although not exclusively). I can say this: there are loads of NKT practitioners who are either not interested or strongly opposed to the ISC. Unfortunately it is always those with little to say who speak the loudest (i.e. Atisha’s Cook, for example). I personally have not seen any discriminatory behaviour by NKT centres or teachers towards people opposed to the activities of the ISC; Of course, that doesn’t mean it hasn’t happened on occasion. When it comes to Gyatso, this is a bit of a personal teaching for me. Although I have moved away from the NKT somewhat (although I also never identified with NKT or any other tradition), as a Buddhist practitioner, Geshe-la is my kind spiritual guide; the source of my spiritual life. Even if I completely renounce the NKT, he will always remain my root guru. I therefore prefer not to get too involved in speculations about his motives or state of mind. So of course, I also will not speculate about HH the Dalai Lama. What I can say, is that like most people on this blog, I am a democratic westerner, so for me there is no problem in viewing somebody as a spiritual guide on the one hand and acknowledging mistakes, problems and my own disagreements on the other. I think Geshe Kelsang’s decision to re-start the demos in 2008 was a mistake; if he is not aware of the extremism and unloving slander that is being propagated by the ISC, I wish somebody could get it through to him. But at the end, perhaps it makes little difference. I cannot personally agree with the view that he is a cult-leader, as this has simply not been in my experience. But that is personal. Yes, the monster seems to have grown and becoming ‘stupider’, if I may say so, as it grows. The protests have absolutely nothing to do with Shugden and everything to do with slander, defamation and name-calling. It is incredibly sad but it is also completely self-incriminating. Thank you for inviting me to write a guest post, I appreciate it. I am not sure if I am the right person to write a post on this blog, as I haven’t had particularly negative experiences with the NKT. However, I am happy to share thoughts on the subject. If you have 500 protesters how many of them are Tibetan according to your obervations? The NKT are the source for the protests but it was obvious that they didn’t have much support from Tibetans. During the 1996-98 protests, there were only two(!) Tibetans, the fake Kundeling Lobsang Yeshi and a Tibetan with the pseudonym “Tashi”. NKT realised that they had to win Tibetans for their cause and place them prominently in the first row or at the videos or images. But when I saw the protesters it were still 95% NKT. It also appears that Chinese dress up as Tibetans and emulate to be Tibetans.